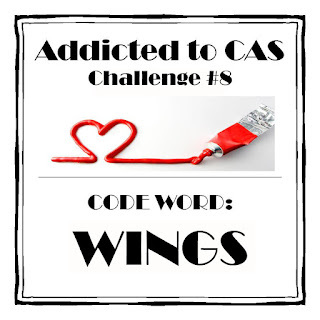 Es gibt bei Addicted to CAS eine neue Challenge: Wings! Christine von All that scraps bietet dem Gewinner 3 Gummistempel aus der CC Designs Range an, oder 5 digitale Stempel Eurer Wahl! Ich bin gespannt auf Eure Beiträge - viel Spaß! so so so cute! the birds are colored perfectly!!! and i LOVE the use of the negative space you used! absolutely amazing! love! 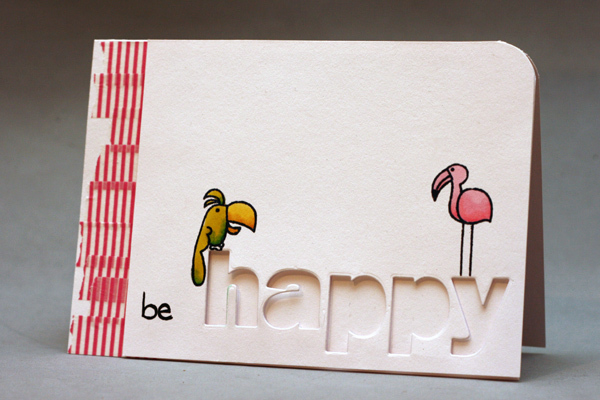 This is brilliant, Christine, I like how the birds are perched on top of that fab negative space "happy"! Another fantastic card! Love it! Have you seen the Moxie Fab Emphasize the Negative Challenge? This would be perfect!! Go for it!! Brilliant card Christine. Great take on the theme. Christine I love your card and how you used the negative space, visiting your blog is always so inspirational , wish I knew how you made your cards and what products you use. I never get tired of telling you how much I adore your design skills... You are simply amazing and unique. I love how you have approached the wings challenge... and my chin fell on the desk with all the STUNNING cards I have seen in your blog in your last few posts. Such a great inspiration, I know who to visit when I need some inspiration to "cardlift"!!!! Absolutely fabulous card Christine - I it.